When you travel to or from Pittsburgh, it is a good idea to make everything as easy on yourself as possible. From the quickest way to book your flight to the most efficient way to get from the airport to your hotel, it is all about making life simple. The simpler the process, the less that can go wrong. That is why you should consider booking Pittsburgh airport parking in advance, and make one more step in the process easy and worry free. There are five airport parking lots at Pittsburgh International Airport (PIT) at which you can book a space for your car in advance of your flight. Both lots are located to the north of the airport terminal. The Pittsburgh International Airport has been named the best airport in the United States by J.D. Power, and second best in the world – so it is not the worst thing to have to spend a couple of hours here. In addition to the nice shopping and dining opportunities, the airport also offers free WiFi throughout the terminal. The airport lies roughly 17 miles from the city center, and Pittsburgh is one of the bigger hubs for US Airways, Air Midwest, Colgan Air and Republic Airlines. While Southwest Airlines does not consider Pittsburgh a hub or even a focus city, the airline offers frequent flights to and from Pittsburgh. For traffic information, see the Pittsburgh traffic map. Planning a long drive to or from the airport, or an odd-hours flight? 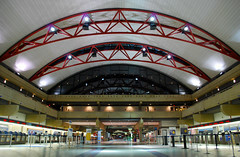 Check out Pittsburgh Airport (PIT) park and sleep hotels. Don’t fancy driving to the airport? Or leaving your car there and paying for parking? Catch a shuttle to Pittsburgh airport.